Antonio González Ruiz was born in Corella (Navarre) in 1711 into a modest family of painters headed by his father, Manuel González Crespo. At the age of fifteen he moved to Madrid with the aim of improving his professional opportunities and entered Michel-Ange Houasse’s Academy, remaining under his protection until Houasse’s death four years later. González Ruiz left for Paris in 1732 with the aim of broadening his artistic horizons then proceeded on to Rome and Naples, acquiring an academic style that would define his subsequent output. On his return to Madrid he made contact with the circle of the sculptor Giovanni Domenico Olivieri, as a result of which he obtained the position of Court Painter in 1739. During this period González Ruiz became actively involved in the foundation of the Real Academia de Bellas Artes de San Fernando. Following the decree issued by Philip V in 1744 authorising the creation of its Founding Committee, González Ruiz was appointed joint director of the Painting department together with Van Loo. To commemorate this significant event he painted an Allegory of the Founding Committee of the Academia de San Fernando (still in that institution today). It would not be until 1752 that the new monarch, Ferdinand VI, sanctioned the decree for the founding of the Academia, maintaining González Ruiz and Van Loo in their posts. To mark this event, in 1754 González Ruiz painted the allegorical portrait of Ferdinand VI as Protector of the Arts and Sciences (in situ) and another portrait of the monarch. The artist’s particular devotion to the Academia earned him the award of an honorary certificate and its gold medal in 1760. González Ruiz’s self-portraits are proof of his pride in these honours, and he always depicted himself wearing the medal. Eight years later he was appointed an academician of the recently founded Real Academia de San Carlos in Valencia. The peak of his professional career was reached in 1771 when he replaced Ventura Rodríguez as director of the Academia de San Fernando. That same year he would be appointed an honorary member of the Imperial Academy in Saint Petersburg. The last years of his life were devoted to the Academia in Madrid and he died in that city on 1 April 1788. The present two drawings can be related to the field of printmaking. 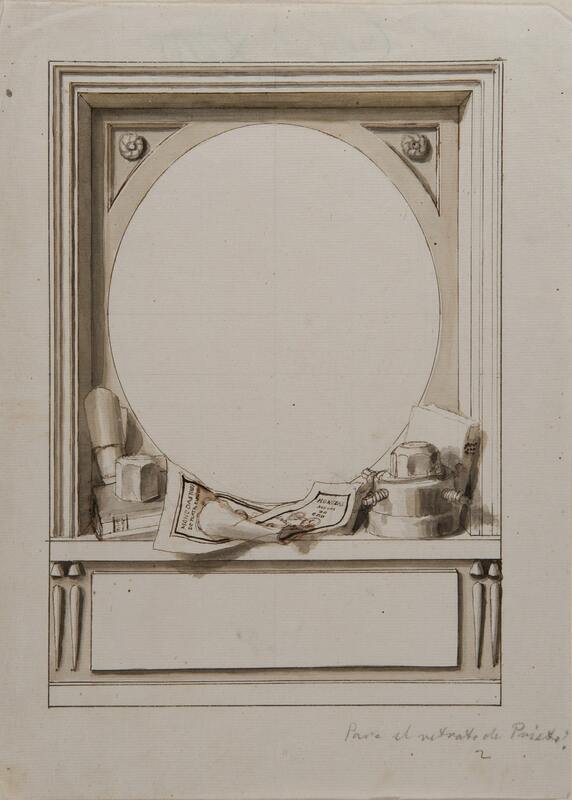 They are two designs for the border of a portrait of the engraver and medal maker Tomás Francisco Prieto, engraved by Manuel Salvador Carmona in 1784. 4 The first is a more elaborate border with a garland of flowers that runs around the upper part. On the podium are various elements that refer to Prieto’s profession: books, a rolled-up sheet with drawings of ancient coins, a punch and other items. The second design is closer to the Neo-classical aesthetic. It lacks the garland and presents a more classical solution in the form of a Roman low relief. In the lower part we again see Prieto’s professional equipment. 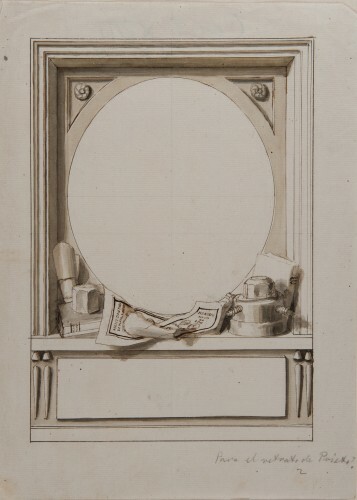 In this image González Ruiz has placed more emphasis on the pedestal intended to house the laudatory inscription, depicting it in high relief and flanked by classical Roman ornamentation such as the arrows and egg motifs. An intermediary solution was finally chosen, while various changes are also evident in the final print. The general composition of the second drawing was used, while the two books were incorporated from the first design, one of which is resting on a wedge. Other modifications include the addition of a pair of compasses on top of the two books, while the parchment with the images of the coins was opened out further in order to convey more clearly Prieto’s status as a medal maker and scholar. For the artist’s biography, see Arrese, José Luis de, Antonio González Ruiz. Madrid, Instituto de Estudios Madrileños, 1973. Various Authors, Calcografía Nacional. Catálogo general. Madrid, Real Academia de Bellas Artes de San Fernando, 2004, vol. I, pp. 208-209, no. 2217. González Ruiz had painted Juan Bernabé Palomino’s portrait in 1741 (Academia de San Fernando, Madrid). It was reproduced in a print of 1802 by Tomás López Enguídanos. Various Authors, Calcografía Nacional. Catálogo general. Madrid, Real Academia de Bellas Artes de San Fernando, 2004, vol. I, pp. 204-205, nos. 2155-2166. Tomás Francisco Prieto (Salamanca, 1716-Madrid, 1782) was an important engraver and medal maker. As the print states, he was Royal Engraver and engraver to the Mints. He was also director of the Real Academia de Bellas Artes de San Fernando. See, El grabado a buril en la España ilustrada: Manuel Salvador Carmona. Exhibition catalogue [texts and catalogue by Juan Carrete Parrondo], Madrid, Fábrica Nacional de Moneda y Timbre, 1989, p. 135, no. 212.